How much does contaminated soil disposal cost? As we keep getting asked this question we thought an update would be in order. At present the UK landfill tax is £84.40 per tonne as of April 2016 . Further increases are being considered by the government. Hazardous soil disposal rates vary across the country from around £50/t – £150/t depending on the type of contamination and volume. Essentially the greater the volume the better gate fee you will get. Non-hazardous soil disposal again varies across the country from around £20/t – £50/t taxed at £2.65 per tonne as of April 2016. If in doubt or need more help why not give us a call on 0131 538 8456 or email us as we have good relations with many landfill operators and should be able to get you preferential rates. 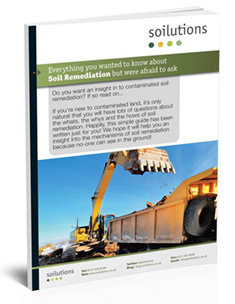 Have you thought about treating your soil and retaining it on site…? Give us a call if you want more info. Like Soil Treatment Centres? I believe you run a few alongside BIFFA. Are you seeing an increased uptake for your services with the increased landfill tax rates?